Jupiter, Fl that is. Nate's Aunt and Uncle live about 3 hours away from us and we try and visit them at least once a year. This time around Nate had two requests for the visit: he wanted to go fishing and he wanted to learn how to filet a fish (both things his uncle is extremely skilled at). Initially, he told his uncle that I wanted to learn how to filet a fish (which I did pre-pregnancy) but that quickly turned into him learning how to filet a fish once he found out there was a more than 0% chance of me hurling on him if I had to do the filleting. (we have a fish market near us that sells whole fish at a significantly reduced price so we thought it would be a good skill to have). So, a couple of weekends ago, we packed ourselves and the dogs up in the car and drove South. We spent a lot of the time down in Jupiter on a boat (with the dogs back at his uncle's house even though we're fairly certain that Zoe would have loved the boat) with Nate fishing and me chilling. The first day we went out with Nate's uncle and Anode (who is basically like family and has an incredible life story) for the afternoon. 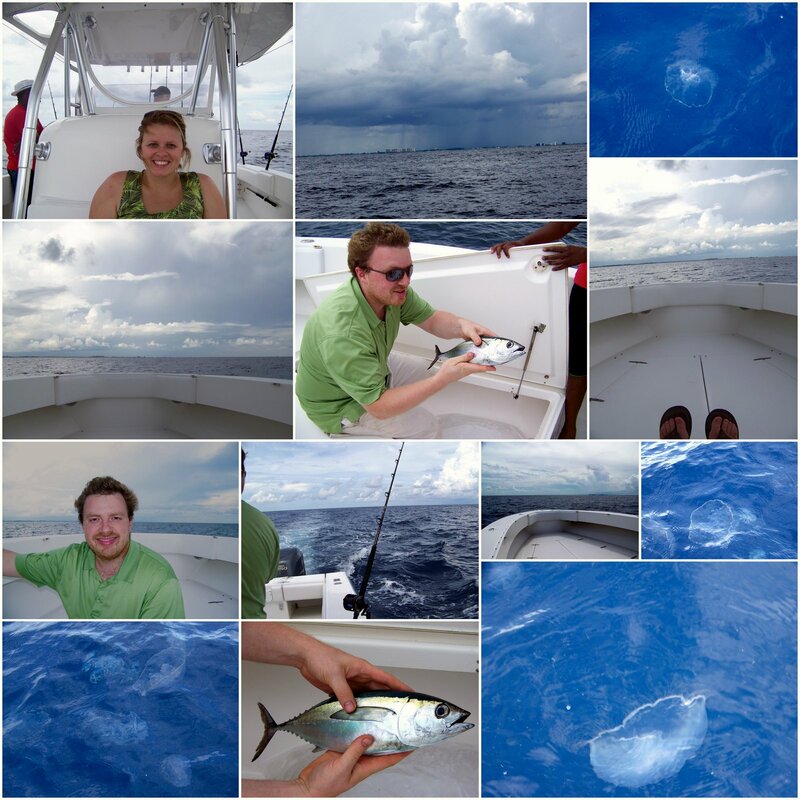 We saw a tremendous number of jelly fish right off the bat as well as a huge turtle. We got off shore before it started to rain, but you could see isolated pockets of downpours onshore which were really impressive. Nate also caught his first fish of the weekend; a black fin tuna. His uncle filleted it and sliced it up and made sushi with it for a party we went to that night. The next day we headed out bright and early so Nate could catch some bigger fish. We spent all morning trolling around and really early on Nate caught a dolphin fish (mahi mahi) which he was super excited about. Throughout the morning he caught a couple more (and "let" one go) and I even helped reel one in. That afternoon, Nate learned how to fillet the fish and we came home with 2 quart size bags! 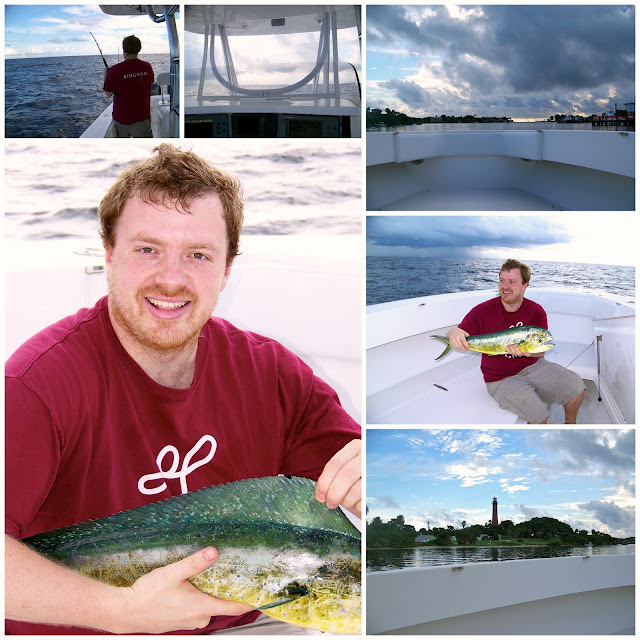 We always have a great time when we visit, but Nate was over the moon this time (and I honestly can say that there are few better ways to relax then being on a boat). Another plus, I managed to have my camera on board, and take pictures, without dropping it overboard (which I've done in the past) so I would say that this weekend was a 100% win.